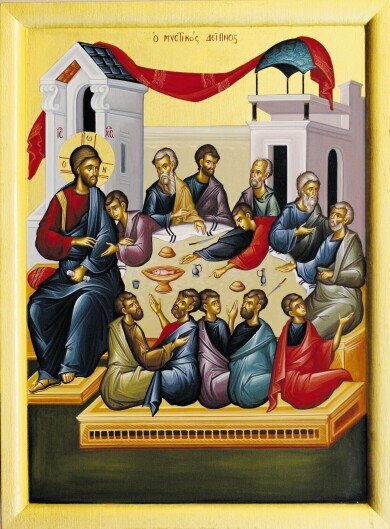 The Saturday of Lazarus is counted as one of the great feast days of the Church. It is celebrated with a great deal of joy and reverence. The Gospel of John (11.3) tells us that while Christ was preaching elsewhere, Mary and Martha, sent word that their brother Lazarus was sick. Jesus did not leave at once to go and visit His ailing friend, however, because through His divinity He knew that Lazarus' sickness would not result in permanent death. Christ knew that Lazarus would be brought back to life by Christ, an act which would bring glory to the Father and the Son. So Jesus waited two days before making the journey to Bethany to visit Martha and Mary and Lazarus, who by this point had been dead for four days. When Martha heard that Jesus was coming she went out to meet Him and immediately fell at His feet and worshipped Him saying "Lord had you been here then my brother would not have died." Christ then asks her to go and call her sister Mary and to show Him where they buried Lazarus. When Martha called Mary she told her sister that the Lord was asking for her and they immediately left their home and went to the tomb. When Jesus saw the tears of the sisters and the sorrow of all those who had come to mourn Lazarus He felt a great deal of sorrow in His heart and wept (John 11:35). Jesus then asked that the stone which was placed in front of the tomb be removed. Martha immediately protested stating that her brother has been dead for four days and that his body will have a terrible smell, but Christ insisted and they rolled away the stone. It is significant that Lazarus had been dead for four days. According to ancient Jewish Tradition, it is said that the soul remained near the body for three days but by the fourth day a person was truly considered to be dead. Jesus, then lifts up His voice in prayer and cries out, "Lazarus come forth," and Lazarus exited the tomb still wrapped in the linen shroud. They immediately unbound him and offered glory to God. During His earthly ministry, Christ had performed many miracles, curing the mother-in-law of Peter, healing the paralytic, healing lepers, those possessed by demons, and the blind. Never had anyone raised someone who had been dead for four days! Everyone in attendance offered praise to God. It did not take long for word of what happened to spread throughout Jerusalem which explains the reception He receives the following day (Palm Sunday). In today's celebration we clearly see the two natures of Christ being revealed. His Divinity through the pre-knowledge of Lazarus' Death and coming Resurrection and His Humanity through His asking to be shown where they buried Lazarus and His weeping. The Church helps to prepare us for the celebration of Holy Week by offering us the healing ministry of the Great Fast. This journey, that began with the commemoration of Adam and Eve being cast out of Paradise, has now brought us to the impetus of Great and Holy Week. Our time of preparation - Great and Holy Lent - is now complete. We endeavor on the course of Holy Week and Christ’s victory over death and the reopening of the Gates of Paradise through His Glorious Resurrection! The prayers and hymns of the Church also play an important role in our preparation. As we look towards the celebration of the Saturday of Lazarus we can read the Biblical account in John 11:1-45. We may also incorporate the following prayer from the Pre-Sanctified Liturgy of the fifth week of Lent, that speaks to our own spiritual state, as we seek to prepare ourselves to be true vessels of the Light of Christ. This first prayer references the example of the Rich Man and Lazarus (not the same Lazarus who is raised from the dead) as found in Luke 16:19-31. It refers to the neglected state of our own soul and seeks to provides us with words of repentance as we seek God’s Heavenly Mercy. Rich am I in passions and clothed in the deceptive robe of hypocrisy, feasting in the evils of self-indulgence. I display immense lack of compassion, for I have neglected my spiritual mind, which lies at the gate of repentance, famished of anything good, and sick with inattention. But now I pray You, Lord, make me like Lazarus, to be poor in sins, lest I be denied when I pray that a finger cool my burning tongue, in unquenchable fire; and make me dwell in the bosom of Abraham, in Your love for humanity. Lazarus has now been in the tomb for two days. He sees the dead from the beginning of time. He gazes at strange and frightening sights, at a countless multitude being held prisoner in the bonds of Hades. Therefore do his sisters lament bitterly, as they look at his tomb. But Christ is coming to bring His friend back to life, so that with one voice everyone might say: "Blessed are You, O Savior! Have mercy on us." 2. We can plan to stay after the Divine Liturgy on the Saturday of Lazarus and help weave Palm Crosses for Sunday’s Celebration. If you are not sure how to create a Palm Cross, no worries, fellow parishioners will be happy to show you how to weave the palms! 3. We can assist in the adorning of the Kouvouklion with beautiful fresh flowers on Great and Holy Friday Morning/Afternoon beginning at the conclusion of the Service of the Royal Hours (10:30 a.m.) . 4. We can ask members of the Parish Council if they need any assistance throughout the week and volunteer to help in any way possible. 5. We can plan on prayerfully attending as many of the services together with our family as possible. Holy Week Service Books are available for purchase to be able to assist us in praying the services. O Christ our God, before Your Passion, You raised Lazarus from the dead to confirm the common Resurrection for all. Therefore, we carry the symbols of victory as did the youths, and we cry out to You, the victor over death, "Hosanna in the highest. Blessed is He who comes in the name of the Lord." Showing compassion for the tears of Martha and Mary, O Christ, God, Your cry commanded that the stone be rolled from the tomb, You raised the dead man, O Life-Giver, thereby confirming the resurrection of the world. Glory to Your dominion, O Savior. Glory to Your power. Glory to You who, by a word, established all things. Christ, everyone's joy, the truth, the light, life, the resurrection of the world, has by His goodness appeared to those one earth. He is the archetype of the resurrection, granting divine forgiveness to all. The Creator of all foretold to His disciples, saying, "Brethren and acquaintances, our friend has fallen asleep." Foretelling this, You taught them by this that as creator of all, everything is known to You. "Let us go, therefore, and see a different burial and behold the lament of Mary and the tomb of Lazarus. For as a prelude to my crucifixion I intend to perform a miracle, thereby granting divine forgiveness to all." Before your own death, O Christ, You raised from Hades, Lazarus, who was a dead man for four days, violently plucking the dominion of death; thus, through this one dearly beloved friend, foretelling freedom from corruption for all humanity. Wherefore, worshipping Your almighty power we cry out, "Blessed are You O Savior, have mercy on us." Martha and Mary said to the Savior, "If You had been here, Lord, Lazarus would not have died." But Christ, who is the Resurrection of the dead, raised from the dead him who lay dead for four days. Let all the faithful come and worship Him who comes in glory to save our souls. You humbled Yourself among the crowds granting the Apostles signs of Your Divinity which you desired to conceal. Wherefore, with foreknowledge, and as God, you foretold the death of Lazarus to the Apostles. In Bethany unknowing the tomb of your beloved friend Lazarus, You asked, as a man, in the presence of the people, where it could be found. But he, who was raised by You after four days, proclaimed Your dominion. Almighty Lord, glory to You. According to both custom and tradition fish as well as oil and wine are permitted on the Saturday of Lazarus and Palm Sunday. Plan on attending the services and worshipping as a family. Prepare yourselves to receive Holy Communion during the Divine Liturgy. Make an effort to arrive during the Orthros Service so that you are able to hear the Hymns of the Day being chanted. Our children's choir also chants the responses during the Divine Liturgy, please feel free to join your voices with theirs in prayer. Plan to stay with your family for the communion breakfast and assist in the folding of the Palm Crosses. Use the Troparion and the Kontakion hymns as prayers before lunch and dinner.